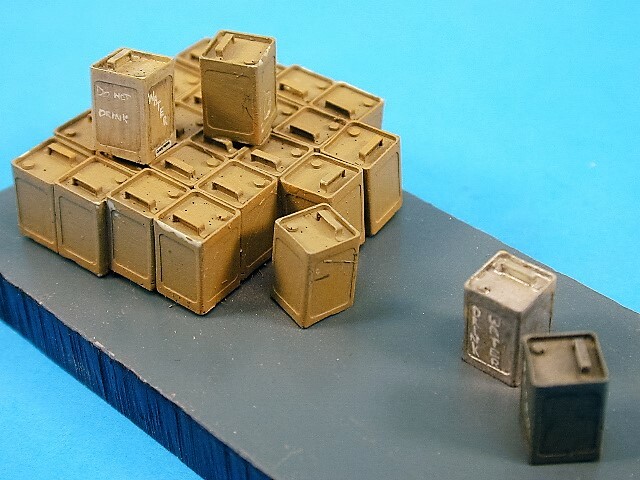 A super value set of 24 resin 1/35th scale British WW-II 4-Gallon cans which were standard issue for Petrol and Water in the early part of WW-2, master patterns by Derek Hansen. Unfortunately they were useless! They were so prone to bursting and damage that they were nicknamed “Flimsies”. Later the Allies sensibly captured, adopted and then copied and mass produced the “Jerry” can.